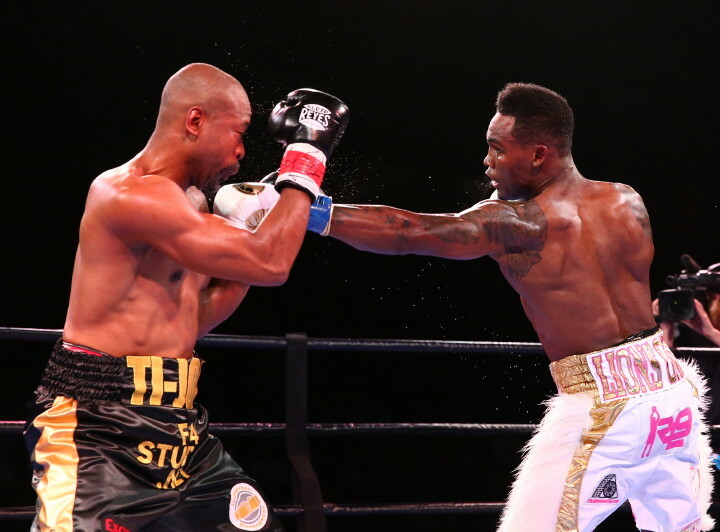 (Credit: Josh Jordan/Premier Boxing Champions) HOUSTON (November 1, 2015) – The Halloween night broadcast of Premier Boxing Champions on NBCSN took Houston’s NRG Arena by storm as undefeated rising star Jermell “Iron Man” Charlo (27-0, 12 KOs) dominated former world champion Joachim Alcine (35-8-2, 21 KOs) in the main event by sixth round knockout. The final televised fight of the evening saw undefeated middleweight prospect Caleb “Sweet Hands” Plant (12-0, 8 KOs) capture a unanimous decision over Tyrone Bruson (22-6-1, 21 KOs). “I established my jab early, and once I was comfortable with my jab the right hand started landing. “I wanted to load up and show that I have power. I knew I was getting to him and wearing him down. It felt great to get the knockout. “I knew after the knockdown in the sixth round it was over, but he was a strong fighter. “Fighting in front of my hometown crowd fueled me. It gave me energy. “I’m a completely different fighter now with my new trainer. My brother noticed it too and told me the same thing. “I’m getting older, better, wiser and improving with every fight. Everything people saw tonight is a product of hard work in training. “My right hand was working well for me, but I stopped throwing it and started focusing too much on my jab. “I didn’t fight for a year and a half, and then I jumped right into the ring with a hungry, young lion. I wanted the fight, but sometimes pride takes its’ toll. “Fighting on a PBC card gave me a big opportunity to show the world what I can do. But (Charlo) was stronger than I thought he’d be. “I wanted to stay focused and get in my rhythm. The whole point is to hit and not get hit, and I thought I did a great job of that through eight rounds. I just need to stay focused for the whole fight. “I got kind of careless in the ninth round and the same thing happened tonight that happened against Willie Nelson, but thankfully I had the experience this time to pull it out. “I wanted to show the fans that I can take a punch, and I definitely showed that tonight. “I’m back! Next time I want to fight someone that’s a little more offensive. (McCalla) was throwing so few punches that it was actually hard to get down the timing against him. “I kept looking for the right moment. I came into the fight trying to outwork him, but I just couldn’t pull it off. “When I caught him with the overhand right I wanted the knockout, but it didn’t come. “Harrison’s jab played the biggest part in him getting the win tonight. “I want another opportunity as soon as possible and I’ll make sure to make the most of it. “The plan tonight was to stay composed and relaxed. I was doubling up my jab and landing combinations up and down his body all fight. “I saw him start to break down after the second and third rounds, but I didn’t want to push too hard. Instead I wanted to stay in control, take him into deep waters, and dominate the fight. That’s what I did. “I thought my power was working well for me tonight. My corner was telling me to throw the left to the body and it was landing. “Caleb caught me once in my left eye in the third round and he had me seeing double for a little while, but it didn’t last beyond that round.